It looks like we may have not seen the last of the Rage Virus after all! It has been quite a while since we were last treated to one of Alex Garland’s viral/zombie thrillers, but according to Garland, he is actually in the middle of serious negotiations with Danny Boyle and Andrew Macdonald regarding a third installation in the series, to be called 28 Months Later. Yes, please! We’ve just started talking about it seriously. We’ve got an idea. Danny [Boyle] and [producer] Andrew [Macdonald] and I have been having quite serious conversations about it so it is a possibility. The second film in the series, 28 Weeks Later, received a ton of praise from fans (it also starred a pre-Hawkeye Jeremy Renner, if you’ll recall), so it makes a lot of sense for Garland, Boyle, and Macdonald to be seriously considering a third film in the franchise. 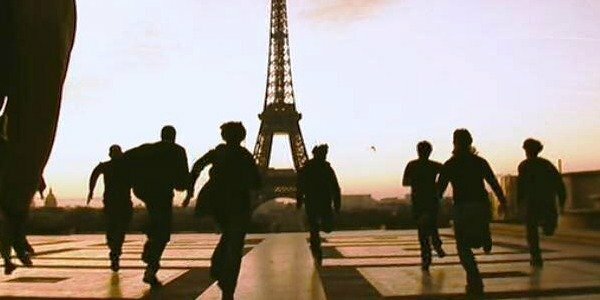 After all, the film’s ending left the door wide open for a third film, especially with that crazy last shot letting us know that the Rage Virus had left the U.K., showing a herd of infected running around in the shadow of the Eiffel Tower. Of course, this isn’t the first time we’ve heard chatter of a third film in the franchise. Rumors have been swirling essentially since 28 Weeks Later released in 2007. Fans were a bit jerked around by Boyle and Garland with lots of promises of a sequel and then promises that a sequel wouldn’t actually happen. Garland didn’t go into the nuts and bolts of bringing a 28 Months Later film to the big screen--saying it was too boring--but he did let IGN know that there were some serious complications standing in the way of a 28 Months Later movie. That certainly explains the years of will they/won’t they we’ve had over a third film. However, Garland has a strong idea for the third film, and the fact that he is having actual conversations with Danny Boyle and Andrew Macdonald should give fans real hope that they may see a 28 Months Later movie soon. It’s more likely to be 28 Months than 28 Years. 28 Years gives you one more place to go. 28 Decades is probably taking the piss. I love the 28 Days Later franchise, and chances are good that I’ll watch any movie that comes out in the series. However, I’m relieved that they don’t plan to zoom that far ahead in the future. Garland is right, there really isn’t a great deal you can do with a story after nearly three decades of the Rage Virus burning across the world. At least with 28 Months Later we can get a bit more in-depth story-telling...and maybe another sequel. Sorry, I’m getting ahead of myself. Sadly, we don’t have any tangible information on a 28 Months Later film apart from the fact that there are serious conversations happening. However, if you want to see some of Alex Garland’s handiwork, you can see his directorial debut, Ex Machina, out in theaters in the UK on January 21, and it will premiere in the US at South by Southwest in March.